A few years ago, I worked for the Intervale Center as a farming consultant for the New Farms for New Americans program run by the Association of Africans Living in Vermont. My job was to help new Americans, primarily refugees from Bhutan, Somalia, and Burundi, in finding markets for their beautiful produce and to help them understand and navigate the vagaries of our cold climate, on-line seed purchases, calendar planning, etc. Most of the time, probably all of the time, I was the one doing the learning. It is an experience I look back on fondly and feel thankful that I was able to get to know these smart gardeners and farmers. Every time I walk into Stone Soup in Burlington and see braised Hakueri turnips at the hot bar, I think of Michel and François who established a long term relationship with the restaurant by growing these perfect and tender roots. They still grow and sell them for Avery and Tim at Stone Soup, and it all started with a face to face meeting, in 3 languages, a seed catalog, and a warm feeling or two. A fitting Thanksgiving side dish, don't you think? 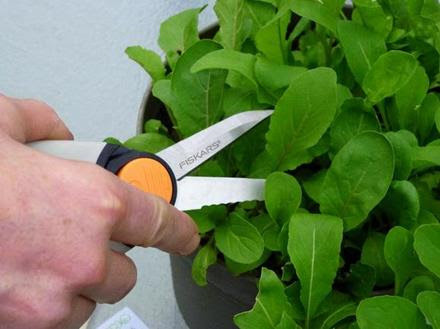 Cut off the greens, but save them for another use. They are delicious! Wash and scrub the turnips and cut into halves or quarters, depending on size. If very small (1 to 1.5 inch in diameter, leave whole). Each piece should be about 2 bites worth. Add turnips to a medium saucepan with water and salt and thyme. Bring to a boil, and immediately lower the heat to medium-low. A strong simmer, low boil. Leave the pot covered for 6 to 10 minutes. When the turnips are tender but not mushy, uncover the pot, add the butter and honey, and gently shake the pan to mix. Cook another 5 or so minutes until the water is mostly evaporated and the turnips are cooked through but not falling apart. Remove the thyme sprigs. Taste for salt and pepper and season accordingly. If you haven't grown your own white turnips, consider it for next year. They are easy to grow, last long into the fall, and are sweet and delicious. While rutabaga and traditional purple-topped turnips have their own charms, these white "salad" turnips are delicate, sweet, and can be eaten raw or cooked. For a fall crop, sow seeds of Hakurei turnips directly into a shallow furrow in the garden in mid-August. They prefer loose, deep soil that drains well. A little compost is always a good idea, but not too much as it can stain them or create crooked growth. When the plants are a couple of inches tall, thin to 1 plant every 2 to 3 inches. Keep well watered. That's it. They are a perfect crop to follow an earlier planting of peas or beans or lettuces or greens. Ruth Henry, one of our many loyal customers, came in a little while ago asking for salad burnet. This is not one of our most popular herbs, and frankly, one that I never grow because I never know what to do with it. She assured me that it is amazing in a special salad dressing she makes. Naturally, this peaked my curiosity and she promised to send along the recipe. Here it is! And now I finally have a reason to plant this pretty little herb that tastes like cucumbers. Thank you, Ruth, for sharing your "secret" recipe with us! Mum's the word!
" As promised this is my family's recipe for salad dressing using Salad Burnet......It's a big hit with lots of flavor! Enjoy"
Shake everything in a jar. Keeps in the refrigerator for a week or so. Rosemary is a great herb for winter use. It can be grown as a houseplant, it can be used fresh, dried, or frozen, and it adds a warming, deep flavor to roasted vegetables, all kinds of braised meats, roasted chicken, pork, lamb or beef, and can be used in soups and dips. Here are a few ideas that will help you make friends with this uplifting and aromatic herb all winter. 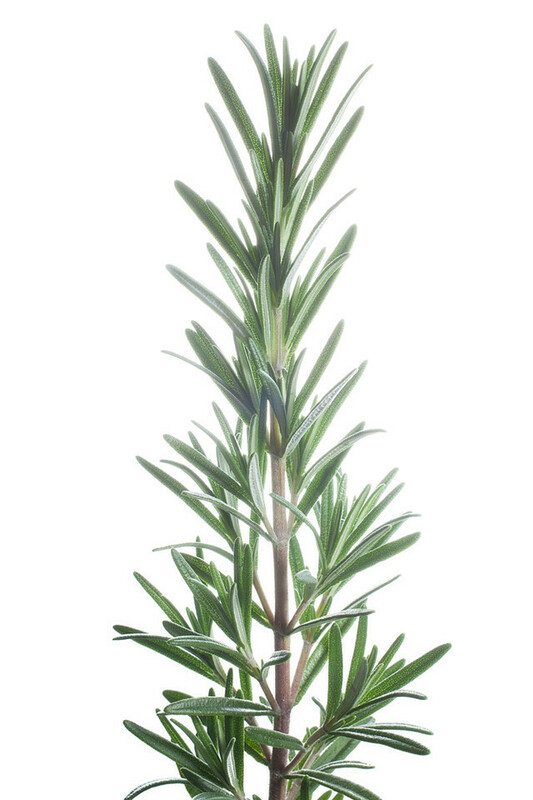 As a houseplant, rosemary is best brought indoors as late as possible. It can take some really cold temperatures, down into the teens, and still look rugged and healthy. When you do bring it indoors, give it a large pot, and keep it away from direct heat sources (woodstove, radiators) and place it in a window with indirect light (east or north facing). In winter time, in your house, rosemary would like to have cooler temperatures and moist air. You can give it moisture by spraying the foliage with a spray bottle of water every couple of days. And only water the soil when it is very dry. You are trying to recreate a foggy, cool San Fransisco winter. When you harvest fresh rosemary or buy it in the store, the sprigs can be kept in the fridge, in a plastic bag that is not sealed tightly for up to 3 weeks. It can also be left out on the counter in a basket, where it will dry nicely and can be used all winter. Once fully dried, pull the leaves off of the stem and place in a jar, in a dark, cool place. Toss a sprig under any meat you might roast - a holiday turkey, ham, chicken, lamb, roast beef, or pork loin. While roasting, the rosemary will add wonderful flavor to the pan juices and the gravy made from those pan juices. Finely chop the leaves and add them to the onions that are sauteed for making stuffing or other casseroles. Infuse some whole milk or heavy cream over low heat for about 15 minutes with a sprig of rosemary, and use this in making creamed soups....squash, tomato bisque, broccoli, any kind of vegetable potage, potato-leek, etc, These soups will all benefit from the earthy, woodsy fragrance and flavor of the rosemary-infused cream or milk. For a rosemary dipping or basting oil, finely chopped 1 or 2 TBS rosemary, mix with 1 or 2 cloves finely chopped garlic, salt and pepper and add in 1/2 cup of good olive oil. Serve in a small bowl and drizzle with a 1/2 TSP of balsamic vinegar and use as a dip for bread or raw veggies. The same mixture can be used to baste a roasting chicken, or drizzled on roasted root vegetables (before roasting, you can toss the veggies with the herb oil), or used as a sautee oil for greens such as kale and chard. Rosemary can also be used as a fragrant addition to hot baths, massage oils, and home made cleaning products. It is one of the most versatile herbs we can grow, and even though it prefers a California climate, with a little persuasion and help, it can adapt beautifully to our Vermont weather. We've been harvesting lots of rosemary this fall, and you can find it locally at Healthy Living and City Market and in the Boston area through Farmers to You. Earlier this week, I went away for a total of 48 hours. This is astounding for a couple of reasons. Not only because it is May, and who do I think I am going away for a whole two days while trying to manage a greenhouse business. No, it's astounding because of the way that I came home. I landed. I arrived. No stress, no jumping into a chaos of activity, no guilt at being gone, no extra work piled up. I came home to a busy crew doing everything well and calmly. I came home to happy customers loading up on plants while wearing big smiles. I came home to a feeling that all is right in my little world. Two days off in May is hard to pull off in this line of work, but what helped me so much was that everyone who works here knew what to do, they made smart decisions and I am sure they handled problems with grace. So, thank you, crew. I also came home to a garden. I love my garden. The moments in the garden are rare and precious for me in May, but the first thing I did when I got out of the car, was go up to the large garden above the barn and finished planting a bed of strawberries. I harvested an armful of asparagus, collected the 4 eggs the hens had laid, picked a handful of chervil and flat full of mache, and I got to work making dinner. I looked at my haul, as the sun was setting and felt embraced by the bounty. We ate late. We ate well. Makes enough for dinner for 3 and leftovers for everyone's lunches. Finely chop a handful of herbs - I used chervil and chives. Finely chop a rib or two of celery - I would have used lovage had it been big enough. Peel the eggs and place in a shallow bowl. 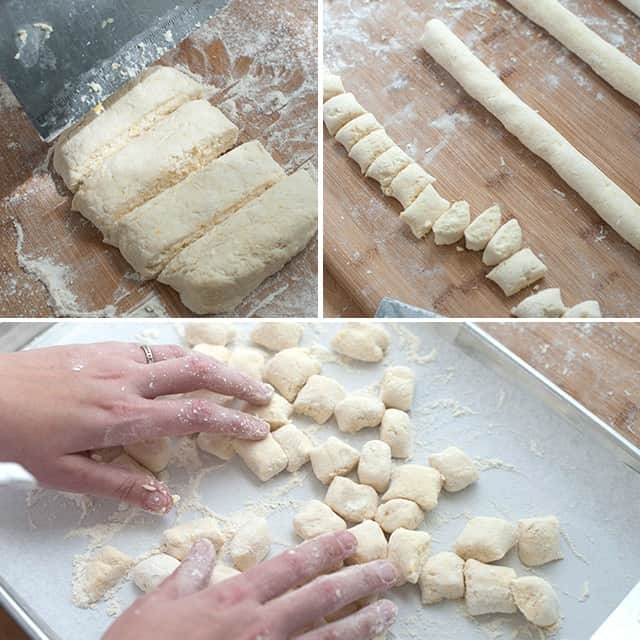 Cut them up with a couple of knives or a pastry cutter. Add enough home made mayo to moisten the whole thing. Blend for a few seconds and then very slowly drizzle in 1/2 cup of olive oil, grape seed oil, or a blend of the two. Drizzle it in a very thin stream while the blender is whirring around though the top of the blender cover. Or you can use a food processor and drizzle it in through the feeder tube. Or you can do it by hand in a bowl, with a whisk. If you do that, try to anchor the bowl by wrapping a damp towel around the base. Or get someone to help you with another set of hands to hold the bowl, or beat the eggs, or do the drizzling. Beat or blend or process until it starts to thicken up. Taste for salt and add a little pepper. If it is too thin, you can add more oil, still adding it in very slowly while blending. We ate this lovely egg salad with toasted Pain de Mie (or Pullman Bread) from Scratch Baking Company in South Portland, ME and the asparagus was steamed and cooled, served on the side, splashed with some lemon juice. Mache is also know as corn lettuce. It is a cold hardy green that germinates only in cool temperatures. We grow it in flats in the greenhouse in the winter and gorge on it from late March to late May. It is a sturdy green with a nutty flavor, and it is eaten as a whole plant, washed well under running water, and dressed lightly with hazelnut or walnut oil and a good sea salt - fleur de sel, Maldon, or sel gris. The small plants have a really interesting texture and a rich flavor that is perfect this time of year when one craves green and fresh. 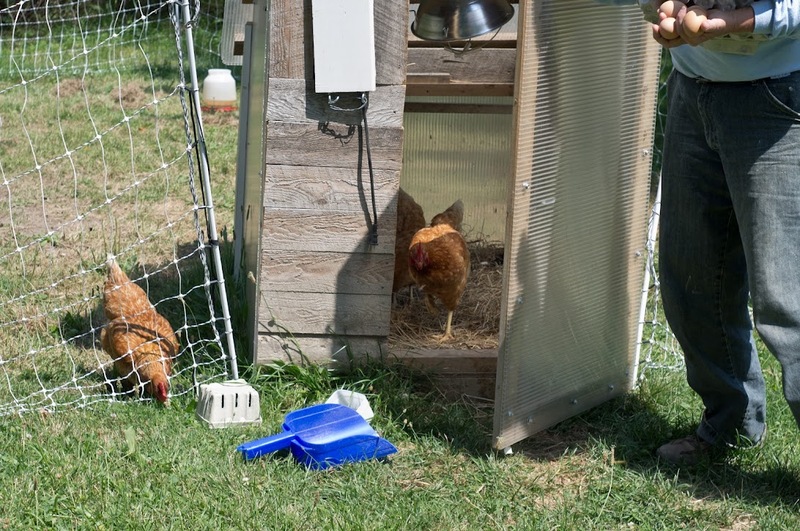 To the garden, the hens, and the amazing crew at Red Wagon Plants, thanks. You make life pretty, tasty, and lovely. Does your counter look like this during tomato season? Do you feel pressed for time, don't want to be indoors too much with the canning pot, yet hate to see a single precious tomato go unused? Well, I can relate. I love to eat tomatoes in winter, the ones from our garden at least, but I don't love spending all that time indoors, canning and fussing. I have been trying something new this year, and I want to share it with you just because I think you will really like it. 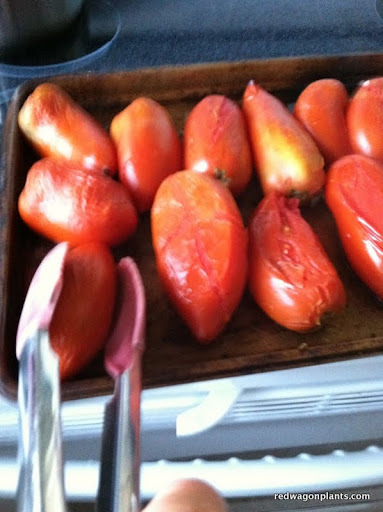 I have been roasting the tomatoes in a hot oven, peeling them, and then throwing them in ziploc bags for the freezer. This gives maximum taste for minimal work. I know you can just throw raw tomatoes in bags and throw those in the freezer, but then you are left with watery, ice shattered, flavorless blobs. I prefer to let the oven do a little work to concentrate the flavors and then have an item to pull out of the freezer that tastes special, an item that has some flavor layers already built in. 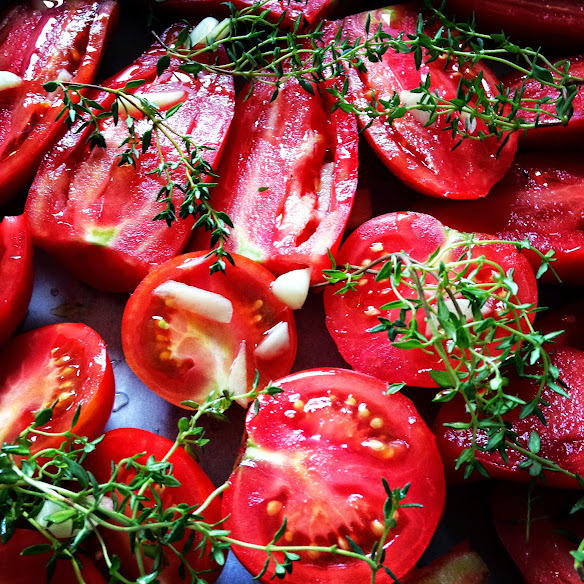 I used to make this with olive oil and garlic and herbs, but realized that I can do a simpler version with naked tomatoes that is quick, easy, and lends itself well to the preserving process. 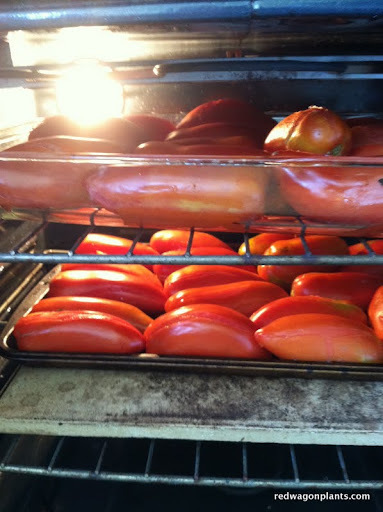 Roasting tomatoes is super easy. You just lay out some paste tomatoes (it works with other tomatoes too, but the cooking time will be longer since they are more watery) in a single layer on a cookie sheet. Pre heat the oven to 400F. Don't add anything - no oil, salt or anything else. We are just going for tomato flavor here. This will allow you to really customize your dish the way you want it when it is time to use the tomatoes in winter. Slide them into the hot oven. Wait 30 minutes. After 30 minutes, take them out of the oven and flip them over. Tongs are handy for this process. If they have released a lot of water, you can drain off some of it, carefully, in the sink at this point. Then they go back in the oven for another 30 minutes. The beauty of this recipe is that you don't have to watch over them. There is alot of what is called "passive time" in cooking and this method is chock full of passive time- I love that I can be doing other things while this is going on. When they are done roasting, I turn off the oven, walk away and ignore them for a while until they have cooled down or I am done whatever project I started or wait until even later that night, when it is dark and the late summer sunshine is no longer tempting me out of doors. Then it is time to peel them. Just cut the tops of with a small serrated knife, and the skins just slip off in one or two quick motions. It is super simple. The fleshy, juicy, thick tomatoes have been reduced to a lovely consistency and can just go into freezer bags at this point. I usually get two quart bags out of one cookie sheet;s worth of tomatoes. So then what do you do with all those frozen tomatoes? Sauces, soups, stews,vegetable sautees, pizza, lasagna, and more will all benefit from these. Anytime a recipe calls for whole canned tomatoes, you can substitute these. I will be posting recipes using these tomatoes throughout the winter, so if you find yourself with a good supply and a lack of ideas of how to use them, check bag for some tips. Enjoy! When today rolled around, I had lots of good intentions to do a bunch of garden chores, exercise, get some office work out of the way, and lots of other tasks that good intentions depend upon. But instead, the chores, tasks and lists took a back seat to making an apple pie with my daughter. She made her first crust, which I learned from my father, which he learned from Molly Stevens, and you can learn how to make it by reading this. Yes, that is right, 3 sticks of butter for a double crust pie. Gulp. Hope to get in that exercise. The apples came from Boyers' Orchard in Monkton, and they were just tossed with a little lemon juice, sugar, and cinnamon. Nothing fancy. The beauty of apple pie lies in simplicity. Getting me to agree to cinnamon and a double crust is about as wild as I will go - I would rather have an apple tart, single crust, with unadorned thinly sliced apples arranged in a pretty pattern. But I suppose that is the French in me. A little egg wash goes on the crust, and vent holes are made to let out the steam so the crust does not turn to a watery mess. The beautiful creation goes into a 475F oven for 10 minutes, then lower the heat to 425F. Check on it after 20 minutes or so, but it usually takes an additional 40 minutes or so to cook. I often turn the heat down one more time for the last 20 minutes. The weather's turning and so is my attitude towards the kitchen. In summer, I would rather be outside, just like you, and it can be hard to make time for all that garden produce to make it into anything but some quick salads and grilled dishes (at the beach, no less). Here is a great dish that works for breakfast, brunch, lunch, dinner and pretty much anything in between. I made a big batch last Sunday and it kept us happy pretty much all day. A green bean and ham hash - take some of those older green beans from the garden (the ones that did not get killed by the frost because they were hiding under the cover of leaves) and chop them up into 1/3 inch pieces. I like Romano beans for this, the wide and flat kind that is loaded with extra flavor and can be cooked a long time if you like a slowly simmered green bean, which I do, in case you are asking. Chop up an onion, some garlic, and a potato. Chop everything pretty small, this is hash, not stir-fry. Heat a tablespoon or so of olive oil, add the onion, garlic and potato and cook until starting to soften, about 8 minutes over medium heat to high heat. I also added pimenton, a smoked paprika, at this point. If you don't have any, a little sweet paprika and cumin might be nice. Keep stirring the onions, garlic and potatoes every minute or so, but letting it all stick a little and brown is okay - that is how you build flavor. Once the potato is softened somewhat, add the chopped or sliced green beans, some chopped ham (I bought an incredible petite ham from Bread and Butter Farm last week) and a good splash of cooking sherry, white wine, broth or water (my order of preference for the liquid). Scrape the pan so the browned bits get incorporated into the liquid, lower the heat, and put a lid on the pan. At this point, the vegetables are both sauteeing and steaming. Wait about 10 minutes hear, stirring once or so and adding another splash of liquid if it is getting very dry. Add salt and pepper to taste, after 10 minutes, and a splash of cream, half and half, or milk - the dairy helps bind all the flavors and keeps the vegetables from getting dry. Stir and sautee another 5 mintues or so, adding another splash of dairy as needed, and that is it. This is great served with an egg on top, over easy or over hard, or scrambled on the side. But really, it is great on its own with nothing else and will keep you going for the whole day. So you can go out and pick apples, take a hike, put the garden to bed, and all the other stuff that still keeps you outside a little longer. Winter is not here yet! Turn on the oven - 400F. Go to the garden and look for cherry tomatoes. Take lots of said cherry tomatoes and cut them in half and dump them into a glass or pyrex baking dish, a big one, so that they are in a single layer. Add some finely chopped cipollini onion. Or red onion, or sweet onion, or any kind of onion really. Add a few or more tablespoons of olive oil. A good one. Don't skimp here, you want everything well coated, slippy-slide like. Grab some herbs like savory, rosemary, oregano, sage, (and/or) thyme and chop them up finely or coarsely, depending on the look you want and your tolerance for stems in food. Add plenty of good sea salt. Toss together and slide pan into a pre-heated 400F oven. Forget about it for a good 45 minutes. Check and stir / flip once, about half way through. It will start to get caramelized and yummy. You can do this ahead of time and just let it sit in the turned-off oven for a while. Gets better with time, promise. Heat up a generous amount of olive oil in a heavy saute pan (1/2 cup or so). I used cast iron and it was lovely. Add onion and peppers to hot olive oil, and let it fry for a while. Stir every now and then. These will sizzle gently for about 10 minutes. They will soften, get fragrant, etc. Chop up about 6 cloves of garlic. Chop up about 4 tablespoons of herbs - a combo of oregano, sage, rosemary, thyme is nice. But really, any woody, fragrant herb will do here. Find some paprika. My favorite is Pimenton (the smokey kind) but if you don't have that, you can use sweet or hot (if you can take the heat.) If you don't have any paprika at all, just skip it; the dish will be good without it. Add garlic, paprika, herbs, and about 1/2 tsp salt to olive oil and peppers in the pan. Stir, and turn down the heat. This will simmer together another five minutes or so over low heat. More time is fine. But 5 minutes is the minimum. Again, expect fragrance here. You can get the pasta water going at this point. You know...big pot, lots of water, salt. Once pasta water is boiling, add the pasta. However much you need and while it cooks finish off the sauce. Squeeze a lemon. Turn sauce # 2 off ( the one on the stove, not the one in the oven) and take it away from the heat. Add the lemon juice. It may sizzle a bit, so stand back. Stir together. Add some chopped parsley or basil (one or the other, not both, please). Take roasted cherry tomatoes out of oven. Add the sauteed peppers and herbs to the tomatoes, scraping up every savory bit. gently and lovingly merge the two sauces. Serve in a bowl with a nice small ladle. This is a rich, olive oil intense sauce. Use sparingly over the pasta with lots of freshly ground black pepper. The flavors add up to more than the sum of the parts. Really. capers (can be added at the beginning or at the end. Gives you two different flavors either way, experiment with which you like best). But really, the beauty of this sauce duo is the simplicity. Don't overdo the flavors right off the bat. Try it as is. Just swoony and simple. One of our customers, Michelle Reiter, sent us this recipe which sounds and looks so incredibly great. She was making a hot soup during that broiling weather we had last week, so you know it has to be great! Thanks, Michelle! And this reminds me to make a note to grow some poblano's next year! The plants sold out before I could get one in the garden, and yet again, I am poblano-less. They are one of the varieties that seem to get more and more popular each year as people plant them and come back for more the following season. What are some of your favorite varieties this year? What are you making with them? Let us know and we can post your recipes, suggestions, ideas. This is the time of year when we start picking out the seeds for next season, so speak up, please! The Garden in July, a Few Tips on Creating Micro-climates, and a Beach Picnic. This summer, the weather has been garden perfect for many crops. All the heat lovers are thriving and the crops that like it cool and moist are doing well where they have been watered and are getting a little shade. I have a nice stone wall thanks to Charley of Queen City Soil and Stone, and the shady side of the wall is a perfect place for crops like celery, mid summer lettuce, artichokes, and boc choi. They benefit from the afternoon shade the wall creates. Additionally, the moisture that builds up at the base of the wall from the terraced soil above it creates a perfect micro-climate within the garden. You can easily achieve this in any garden with strategic rock placement - not a full-fledged wall necessarily, but a few stones stacked up to retain moisture on a slope or to allow for north-side shade in a fully exposed garden. Look around your garden for other mico-climates like tall plants that can be used to create shade for summer plantings of lettuce. Right now, I have lettuce planted in odd spots throughout the garden - under a sunflower, at the base of the stone wall, and under some tomato plants. The eggplant has been tremendous this year and last night, we had a great meal of marinated eggplant while sitting at the lake, scooping up piles of the salad with pieces of pita and a little feta. Here is the recipe. I used a combination of the Gretel and Machiaw eggplants (pictured above). Pre-heat oven to 400 degrees. Coat a cookie sheet with a layer of oil and layer the eggplant slices in a single layer. Bake them until soft (about 20 minutes), turning once and drizzling with a little more olive oil about half way through. Blend the vinegar, remaining olive oil, salt and pepper, capers, and mint together. Place eggplant into a bowl, drizzle with the dressing, and stir to combine. Let rest for at least a half hour or place in fridge (up to one day). When ready to eat, sprinkle with feta. Eat with flatbread, while sitting near a cool body of water. Green butter lettuce has to be my all time favorite lettuce....perfect texture, a color that can only be described as translucent and pearly, and a delicate flavor that truly is butter-like. I eat it in all sorts of situations and for all sorts of meals. Breakfast is toast with a thin spread of butter, snipped chives, some shavings of cheddar and a pile of butter lettuce leaves. Lunch is butter lettuce with a white wine vinaigrette, a piece of bread, and maybe a little tuna with herbs. Dinner will always include a butter lettuce salad with lots of snipped chervil. Or perhaps some grilled flank steak with butter lettuce, cilantro, thai basil, shallots, and a little hot pepper drizzled with a light sesame dressing. Late May and June are the butter lettuce weeks. I plant a four pack of the lettuce every week from mid- April through August and I am rewarded with huge, green and white pillow-like heads of tenderness. Here is a blog recipe from David Leit, who also appreciates this delicacy. He is recommending a blue cheese dressing, which will be great later in the summer, but for now I cannot get enough of the delicate flavor and taste, so I will stick to my lighter dressings. Herbs are one of the key ingredients in summer cooking that make the food really stand out, but we don't have to stop once winter comes. The key, in my mind, to things tasting good is to layer in flavors using various simple techniques. Herbs are the fastest and simplest of those methods, other than say, adding salt. We have had such a warm November that I am still clipping herbs right out of the garden and the herbs in pots are still doing well on the back porch. I have also started to bring in herbs from the garden to dry them. The simplest method is to cut whole branches of the woody herbs such as thyme, sage, winter savory, and rosemary and tie them into bundles and hang them in a dark, well ventilated place. I usually leave them hanging for a month or so, and then place all the bundles into a large basket lined with a clean dishcloth. I use a large amount of herbs all winter, by the handful, in simmering stews, soups, under and over roasted meats, inside the cavity of roasted poultry, etc. I just can't think of a simpler and more effective way to add depth to whatever is cooking. The leafier herbs, such as basil, cilantro, parsley and chives can be frozen for year round use. This is best done with the aid of a food processor. I take handfuls of washed herbs (stems removed) and pulse them in the bowl of the processor until they are finely chopped. I then drizzle in a little olive oil while the machine runs. Once it all looks like a nice green mush, I scoop it all into freezer bags and shape it into a thin, flat layer before placing the bags (lying down) into the freezer. This allows the herb puree to freeze in a thin sheet that can be broken into smaller pieces when you are ready to use it. This frozen herb puree is a great addition to soups, stews, sauces, roasted or steamed veggies, and salad dressings. I simply toss in a chunk of the herb popsicle at the end of the cooking time of whatever I am making so that the fresh flavor really comes through. You can also bring herbs inside in pots for the winter and place them near a sunny window. I keep a few herbs in pots all summer just for this purpose, but you can dig up whole plants out of the garden and repot them with some good potting soil. These are nice herbs to use as garnish, or chopped into a fresh salad. These are not the herbs I use by the handful, but when I want just a teaspoon of fresh, chopped herbs to add a final punch to a dish. Some of the herbs that work well for bringing indoors are thyme, parsley, rosemary, sage, oregano and basil. The sunnier the window, the better luck you will have. You can also use some grow lights on a timer for even better results. It's best to water these indoor herbs about once a week, but since they are in a semi dormant stage, they don't need to stay as moist as they would in the summer. The herbs won't always look great, but they will always smell good and have enough flavor boosting powers to earn their keep. This is one of my favorite things to do with butternut squash, and every time I make it, I am reminded of my friend, Robin Holland. She made it for a mom's group I was a part of when my daughter was a baby and a toddler. A dozen or so of us would get together once a week, share an amazing meal and, together, relish in the joys and burdens of motherhood. I still make this often, and every time, the flavors combine together to transport me back to those days. There is something inherently grounding and warming about this dish. In a large, heavy pot, heat the olive oil. Add the onion, bell pepper, garlic, chili powder, pepper flakes, bay leaves, and stir until soft and starting to brown. Add 1 cup of the apple cider, and scrape up the brown bits and allow it to cook down by about half the volume. This helps to concentrate the flavors of the aromatics (onions, bay leaf, etc). Next add the squash, and the soaked beans, the remainder of the liquid, and allow to cook over medium to low heat for about 1 1/2 hours, or until everything is soft. Finish the stew by adding the maple syrup, and about 1 TBS salt (I find the beans and the squash really need lots of salt). Stir and wait a few minutes before tasting. Adjust with more syrup or salt if needed. This is great served with the garnishes, some corn tortillas or corn bread, and a piece of cheddar cheese. The warmth and sweetness create a harmonious and satisfying balance. Tonight's dinner was another super easy one and I averted yet another trip to the grocery store. First, I found some feral potatoes. I was turning over a plot of soil in the garden where the potatoes once stood and there they were, gnarly and red, asking why they had been forgotten. After a good scrub down, they got tossed into a pot of cold water and gently boiled until tender. Did you know potatoes should always start their cooking in cold water? That way, their temperature rises gradually and evenly. They don't end up with the dreaded mushy exterior and crunchy interior. While the potatoes were cooking, I did a quick cabbage braise which turned out to be luscious and silky. Here is the recipe. Heat up olive oil and butter together over medium high heat. Add leek and stir occasionally for a few minutes until leek starts to soften. Add the apple and cabbage, and stir. Cook a few minutes, add the vinegar and salt to taste. Put a lid on the pot, and cook about 15 minutes. If there is too much liquid, you can take the lid off and raise the heat to boil off the extra liquid. Finish by adding more butter if you like. This is great spooned over simple boiled or mashed potatoes. The sweetness of the apple and leek is a nice balance to the acidity of the vinegar. This is also delicious, for the meat eaters among us, with some salt pork, bacon, or cured sausage. Just add it in at the beginning with the leek, and then let it simmer away. Reduce some of the butter or olive oil if you do the pork ad-ins. My pantry is small, but pretty well stocked with staples. Between that and the garden, it's easy to spend a week without going to the grocery store. I get milk from Family Cow Farmstand, eggs from a neighbor, and a few items at the Burlington Farmers' Market during the summer. The main thing I go there for is the cheese from Does' Leap Farm: they make the best chevre I have ever had. The feta is fabulous too, and I used it in this dish. Having a garden, visiting the farmers' market, and having a well stocked pantry (I buy stuff like pasta, beans, and olive oil in bulk, when it is on sale) means you can throw together simple meals for not much money. We stretched Sunday's dinner to make 8 meals over two days. That comes out to ahout .33 a meal. Pretty good, huh? I made this escarole feast after I noticed a huge, beautiful head of the stuff in the garden (wish I had a picture). It's one of my favorite vegetables, and has to be grown to be appreciated. The flavor gets kind of bitter if it sits in the fridge too long, but if you cook it up right after harvesting, it is magnificent...silky, unctuous yumminess. Frugality means not being afraid of leftovers. Often, I will cook one large meal and then stretch it by morphing it into other things. Shape shifting dinners. Here's what I made on Sunday night, and a few ideas for the leftovers. You can substitute any other greens if you must, but really, you should give escarole a try next year in your garden...it's pest free, super cold tolerant, and gorgeous. But for now, there might even be a head or two with your name on it at the farmer's market. 3 cloves of garlic sliced, minced, or crushed (all three ways produce different results, figure out what you like). Optional garnishes -- fresh squeezed lemon juice, capers, feta or parmesan, another drizzle of olive oil. Get your (salted) pasta water going in a large pot. While that is coming to a boil, heat the olive oil in a large skillet or dutch oven type of pot. Saute the onion or leeks, garlic, and jalapeno over medium high heat, stirring. After about 5 minutes, when everything is softening and realeasing its aroma, dump in all of the escarole (still wet from being washed so that it creates some steam). Put a lid on the whole pan and ignore it for a few minutes. Open the can of beans, rinse them if you need to, dump them on top of the escarole and put the lid back on for a few more minutes. By now, you should also be cooking your pasta to the toothsome al dente point - i.e. not mushy. Stir up all the escarole and beans so that they are evenly distributed, and season with the salt and pepper to taste. Drain the pasta, reserving a little of the cooking liquid if you want to stir it into the finished dish later if it seems dry. You can combine noodles with the vegetables in the big skillet or pot, or alternately, you can serve big shallow bowls of pasta with the veggies on top, passing the optional garnishes around at the table. This is a great dish to serve reheated as is, or you can turn it into a stew by reheating it with some broth. I also love it with an egg cracked on top, and steam poached: just put the lid on the pot you are using and make sure there is enough liquid or fat in the bottom of the pan so that nothing sticks. Super simple, and super yummy. The escarole becomes silky, with a little bit of pleasant bitternes and the garlic and jalapeno balance it all out. Bon Ap!